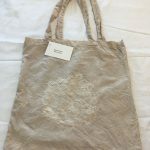 Spin Flora – Spin Flora not Fauna, Plant fibres dyed with plants. 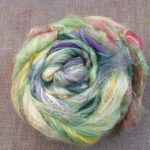 Spin Flora not Fauna, Plant fibres dyed with plants. 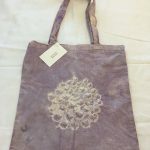 I have been experimenting a bit with various plant dyes. 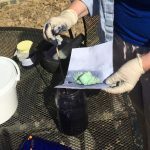 I try to reuse the dye baths several times until the dye is fully exhausted. 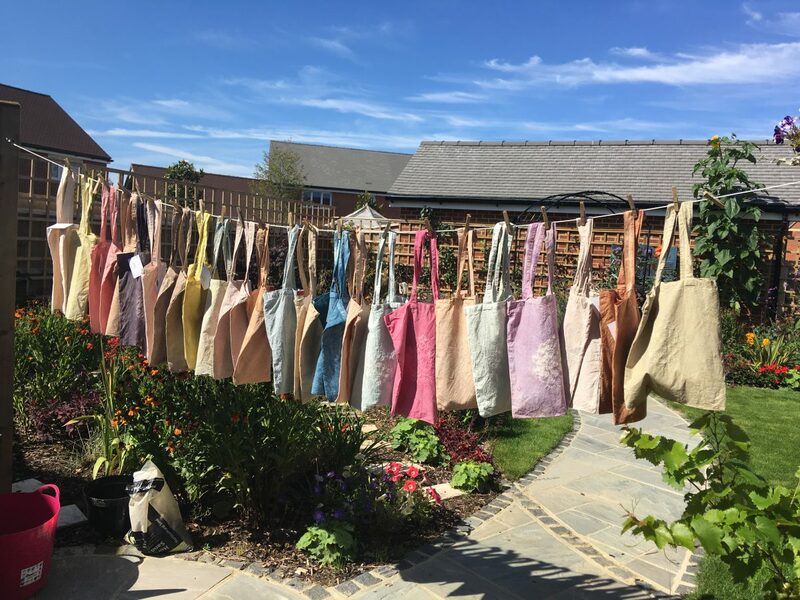 The variations that you can get in colour are amazing, depending on the strength of the dye bath, the acidity of the water, the temperature of the dyebath and how long you leave the item to soak in the dye bath. 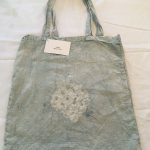 Here is a photo gallery of cotton tote bags that have been dyed with plants. 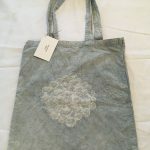 Please visit my Spin Flora shop on Etsy for the latest selection of plant dyed tote bags. Every few days, I am experimenting with a different natural plant dye, to see what colours it creates. 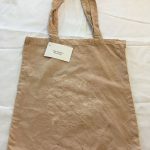 The colours and shades that you can get vary a lot, depending on the acidity of the water, the mordant you use, the strength of the dye stock and the type of material you are dyeing. Logwood or Haematoxylon Campechianum comes from the heartwood of the logwood trees that grow in Mexico and Central and South America. Logwood can produce rich deep aubergine purples, dusky blues, soft lilacs and greys and silver tones. Logwood is not extremely colourfast, so a bit of care needs to be used in selecting the final final end use. 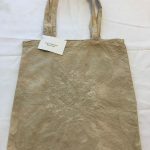 Choose to make items that won’t get a lot of sun exposure. 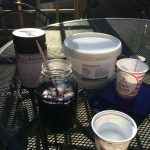 I made a Logwood dyebath using 30 grams of Logwood powder. I let the dyebath simmer on medium heat for a few hours, not letting the bath reach boiling point. I added pre-mordanted fabric to the dyepot and let that simmer for a few hours. The scarf is made from Cotton Batiste with hand rolled hems. The scarves are completely made by hand in India, mostly by women, who are paid a higher salary than most due to the craftwork involved. 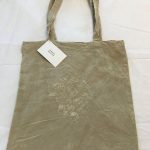 No exploitation, no child labour, great quality. 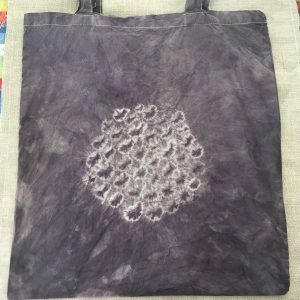 The scarf has been decorated with a traditional Shibori resist dye technique. 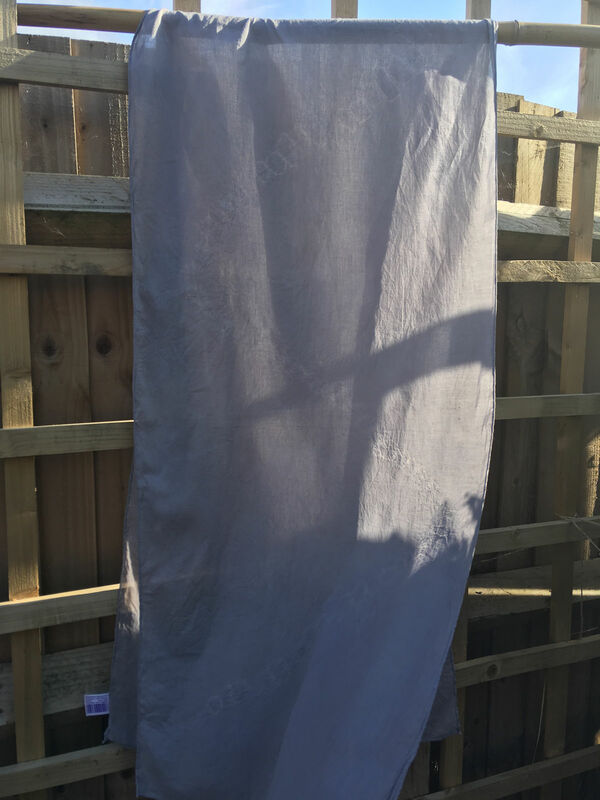 This scarf uses a Hitta Miura style of design where small areas of the fabric are hand knotted and then dipped into the Logwood natural dye vat. A soft zigzag Shibori design runs across the length of the hand dyed scarf. 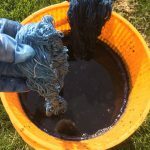 There was still a lot of logwood colour left in the dyepot so I added pre-mordanted hemp roving into the dye stock and let this gently simmer for a few hours. 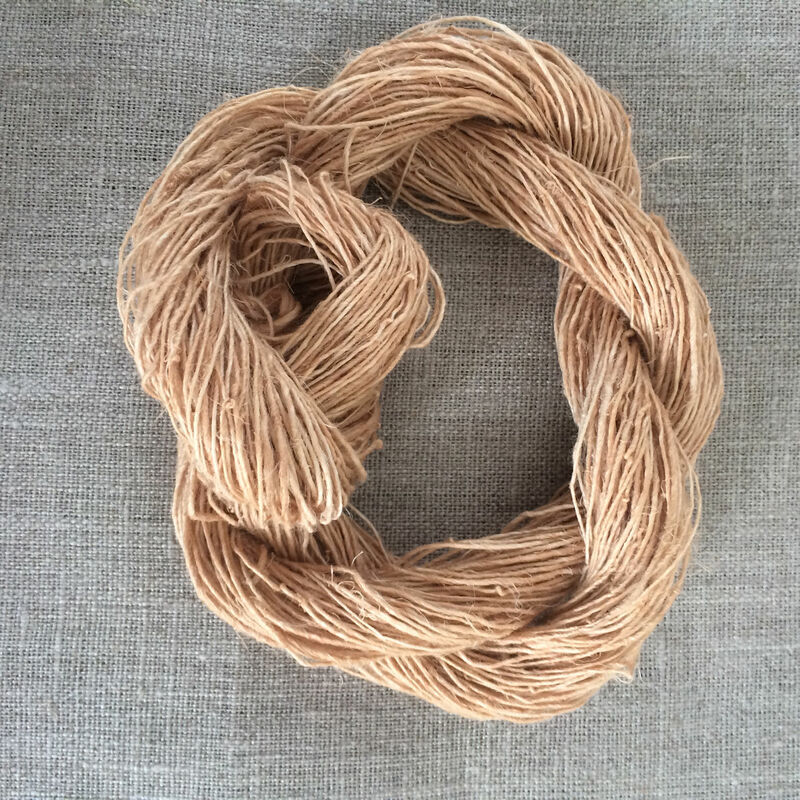 The natural dye process helps to soften the hemp fibres making it easier to spin. 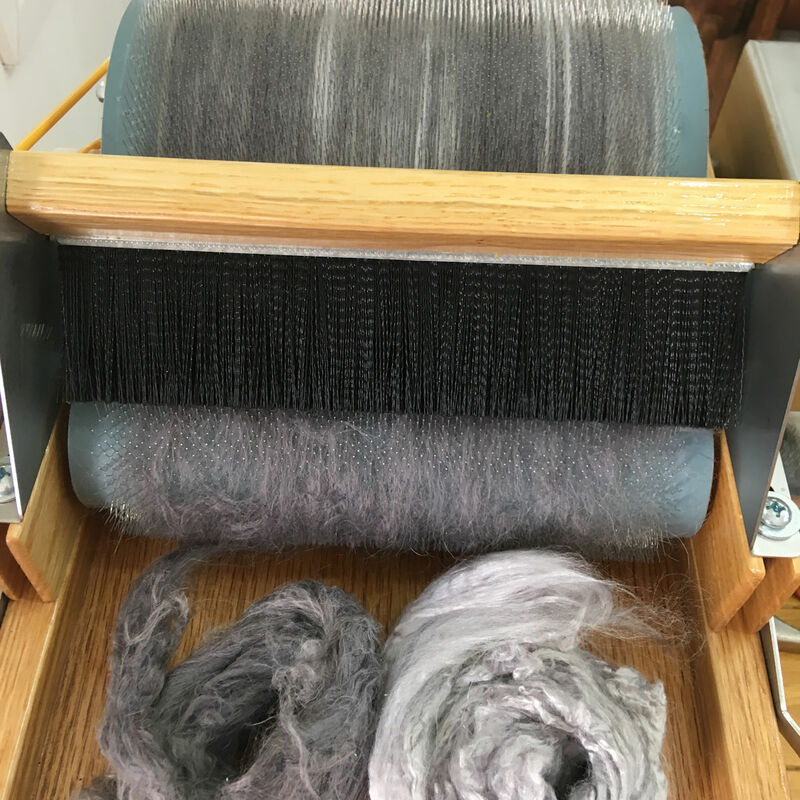 Adding the pre-mordanted bamboo roving into the logwood plant dye stock, gave a beautiful and shimmery silver colour to the bamboo roving. Hemp and Bamboo are wonderful when they are blended together. 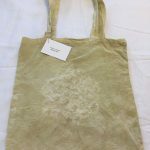 Please look for my Logwood naturally dyed products in my Spin Flora Etsy shop. 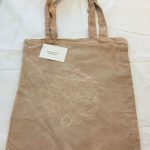 If you can’t find them, please ask and I would be happy to make a custom order for you. 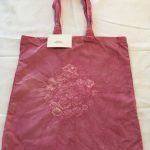 To keep in touch with my latest Spin Flora products, please sign up for my RSS feed, or visit and like my Spin Flora facebook page. Today’s plant dye vats are a bit smelly. Partly due to the mordants I have used and partly to a long fermentation (mostly because I forgot about them and left the dyestuff solution sitting outside for several weeks). This could be a good thing though, as fermentation helps to extract the dye from the plants. 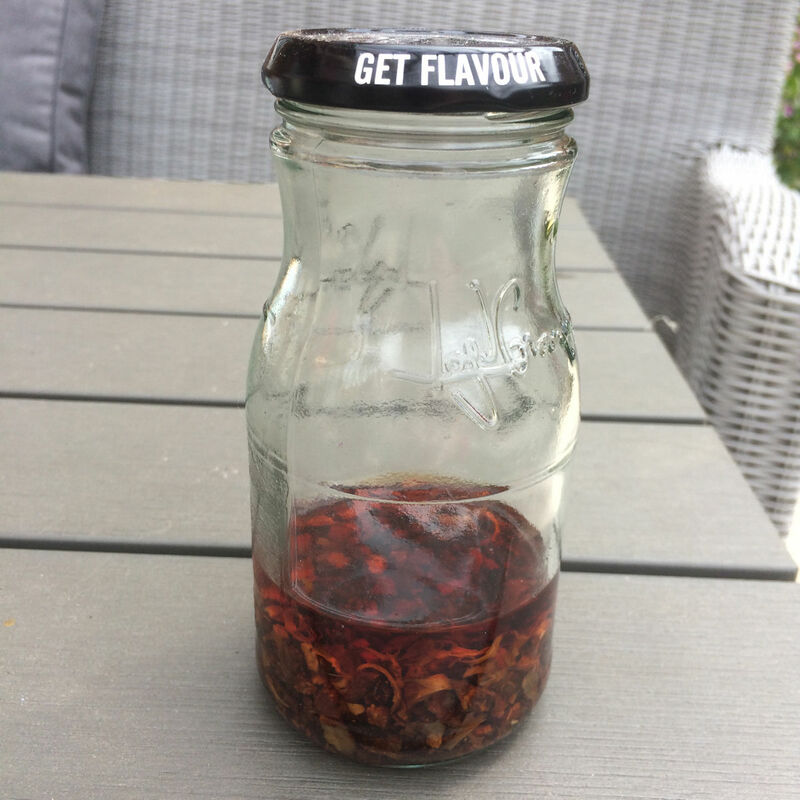 Steeping in a jar for several weeks. The dyestuff has turned a nice shade of pink. 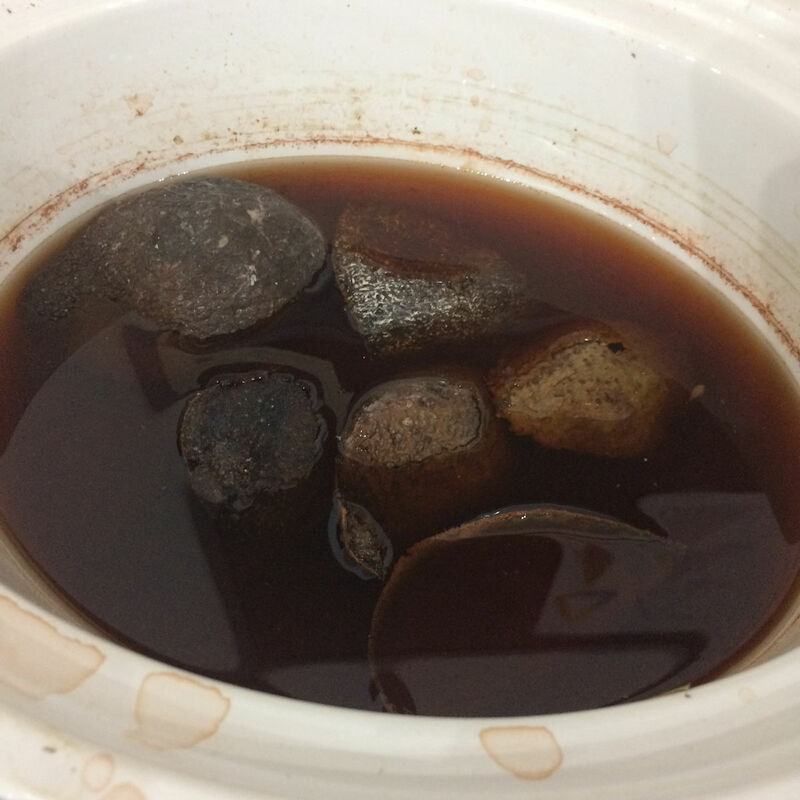 I put the dye stock into a dyepot filled with water and let it simmer for several hours. Then I added pre-mordanted handspun flax into the dye pot, let it simmer for 2 hours and turned the heat off. I left the yarn to sit in the dyepot overnight. Wonderful colour! There was still a lot of colour left in the dyepot so then I put a cotton tote bag into the pot. 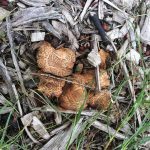 A few weeks ago, I discovered what looked like Sarcodon imbricatus (that grow under pine trees) or Sarcodon Squamosus (that grow under spruce trees) fungi growing amongst the bark mulch in our garden. I couldn’t identify which type of bark mulch we have so don’t know whether these will yield any nice colour, but this will be a good experiment none the less. In Norway, fungi dyers have had good success in producing green and blue dyes using Sarcodon fungi. 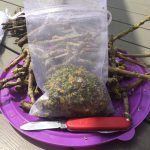 I had heard that Sarcodon produce better colour when picked in the late fall, so I thought that perhaps freezing them would help to bring out the dye pigment, if there is any. 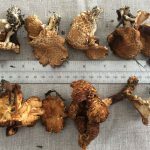 I cut the fungi into small pieces, put them into a plastic container and added a bit of water – and into the freezer for a few weeks. When I took them out of the freezer, I added a few drops of ammonia to change the pH to alkali, and let the fungi sit outside for a few weeks. After this fungi mixture had fermented, I strained the fungi into a mesh bag and put it all into a dyepot filled with water to simmer for a few hours. 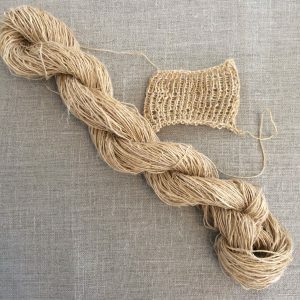 Disappointing grey/brown on handspun bleached flax. The plant dye world doesn’t always produce colourful results, but interesting to try. 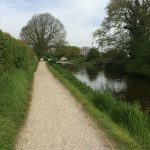 After a particularly windy night, I took a short walk along the Canal near our house. The wind had knocked down a lot of tree branches that were covered with lichen. I gathered some of them up and took them home. I am not very familiar yet with lichens of the UK, but I think this is xanthoria parietina, which should produce yellow dyes. 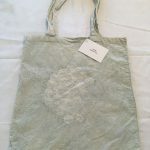 I scraped the lichen off the branches and put them into an organza mesh bag. 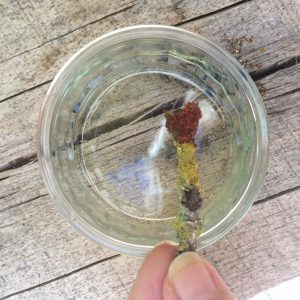 I put the lichen dyestuff into a dyepot, added water and let the dye stock simmer for a few hours. Some Xanthoria parientina have 2 dye pigments, yellow and red. The red pigments can also produce pinks, plums and blues when fermented in ammonia. 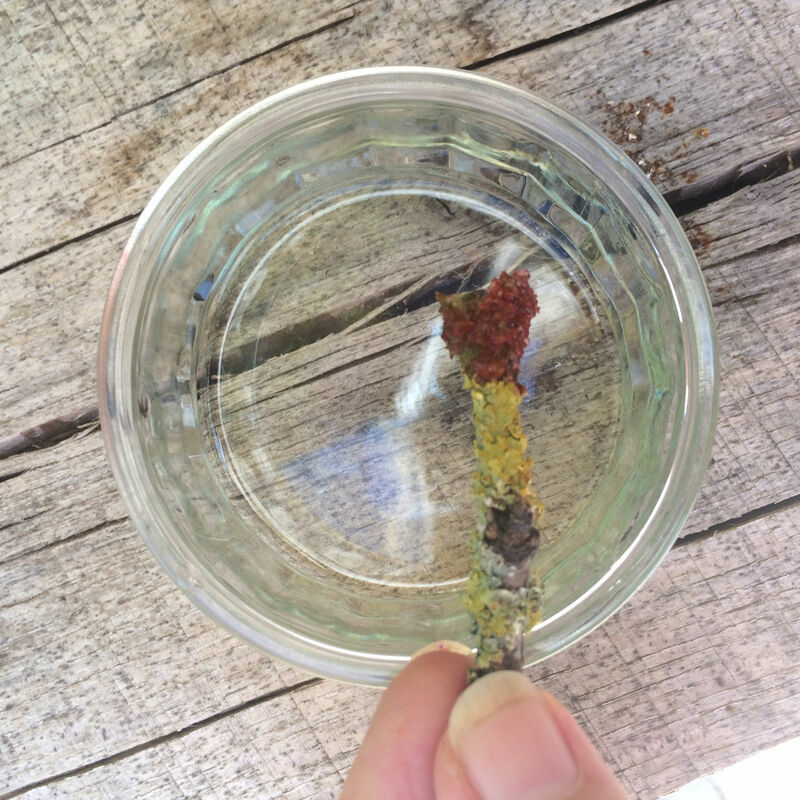 To test whether the xanthoria will produce the red shades, add a bit of household bleach to the lichen. If it turns red, then the dyestuff can be fermented. 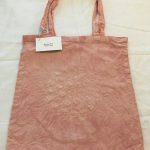 The cotton bag didn’t turn red but is a pretty shade of soft pink. I suppose a lot more lichen would be required to get deeper colour. 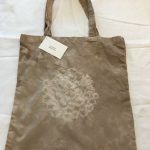 If you would like to shop for one my Flora dyed Market Tote bags, please visit my Spin Flora Shop at Etsy for the latest selection. 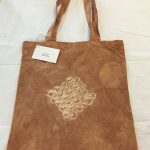 If you would like more information about the Flora dye workshops that I offer, please visit Paivatar Yarns. 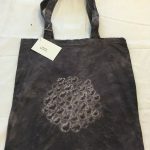 Please visit and like my Spin Flora Facebook page if you would like to be updated on my latest work. When I create new yarn colours I like to use inspiration from my garden and my world around me. Today the lovely Monet Petunias are in full bloom, with wonderful, soft, pastel shades, just perfect for a new roving and yarn colourway. 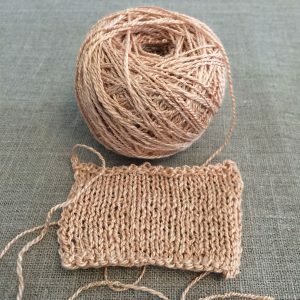 When I design the yarns, I also think about the different fibre characteristics of the various flora fibres and combine them together as I card the unique blends. 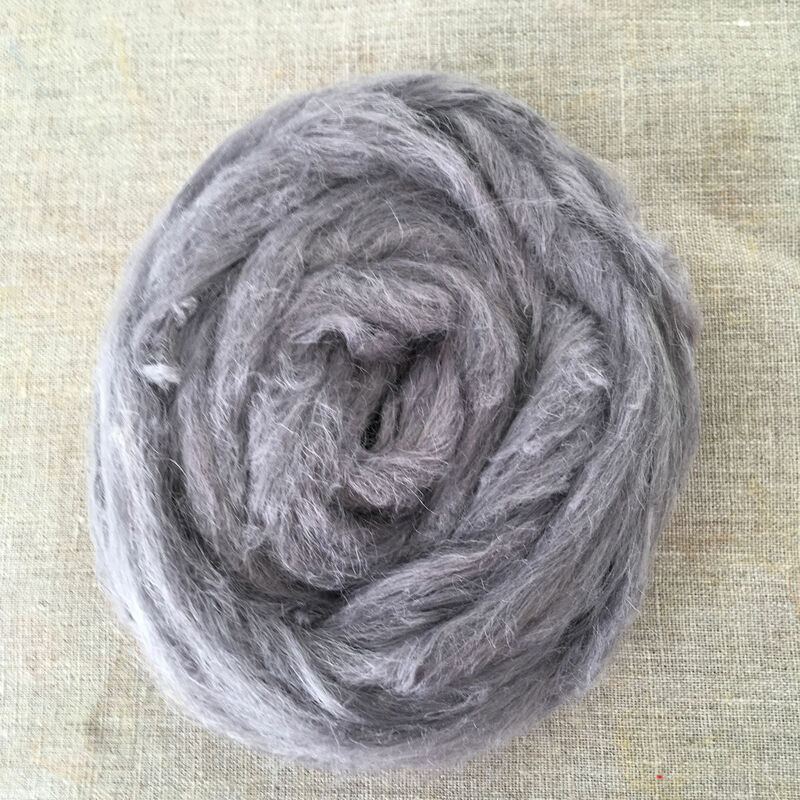 In this hot weather, it is wonderful to both spin, knit and wear flax or linen. Flax is cool and crisp, but can also be a bit rough, until it has been gently softened through many washes. Adding in some other flora fibres that have more silkiness, softness and drapability help to enhance the properties of the hand spun yarn. 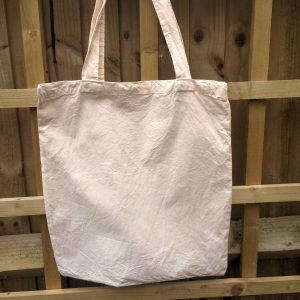 Bamboo, made from cellulose pulp is spun into soft and silky filaments. Bamboo is cool to wear as it has high water absorbency, and also has antibacterial properties. Soya silk, is a protein fibre made from the by-product leftovers of soya milk. 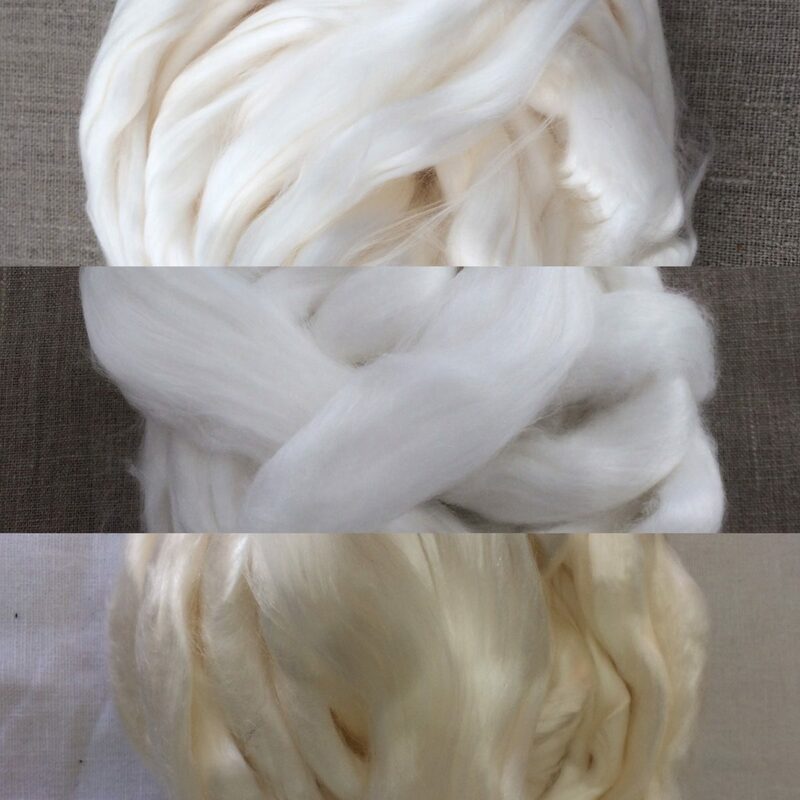 Soya is soft, shiny and very silky to the touch, adding a touch of silk elegance, without the silk worm. 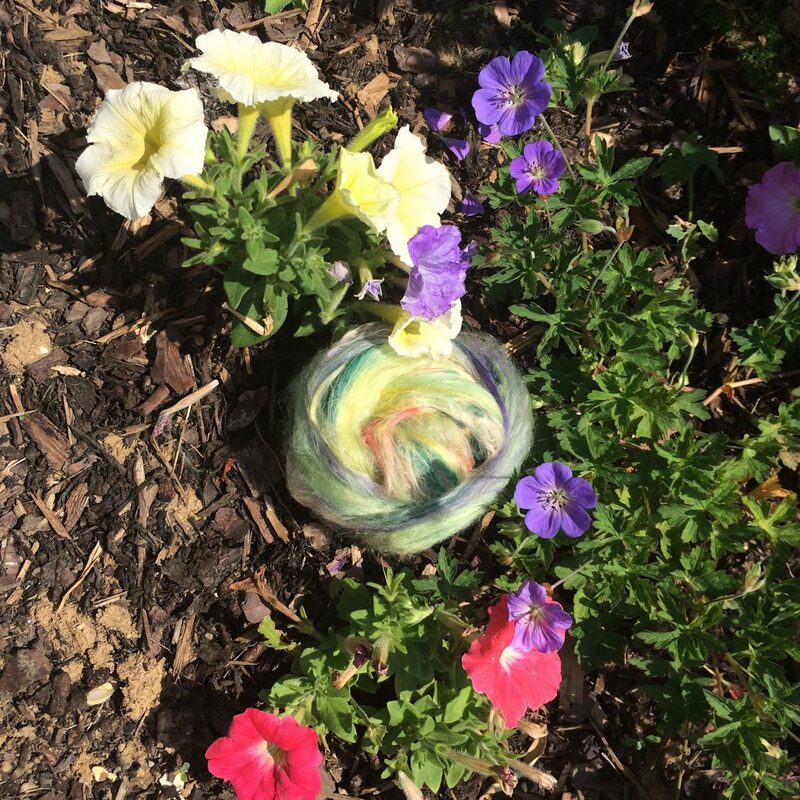 Please contact me if you would like a custom order of this summertime vegan roving. If you are not a handspinner, I would be happy to also custom spin some for you. 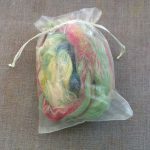 If you would like to try making your own flora blend yarns, you can find the fibres in my Web Shop. 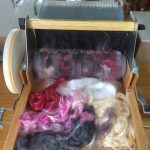 I will also be creating more one-of-a-kind fibre blends that you can find in my online shops on Etsy, Folksy and Artyah. 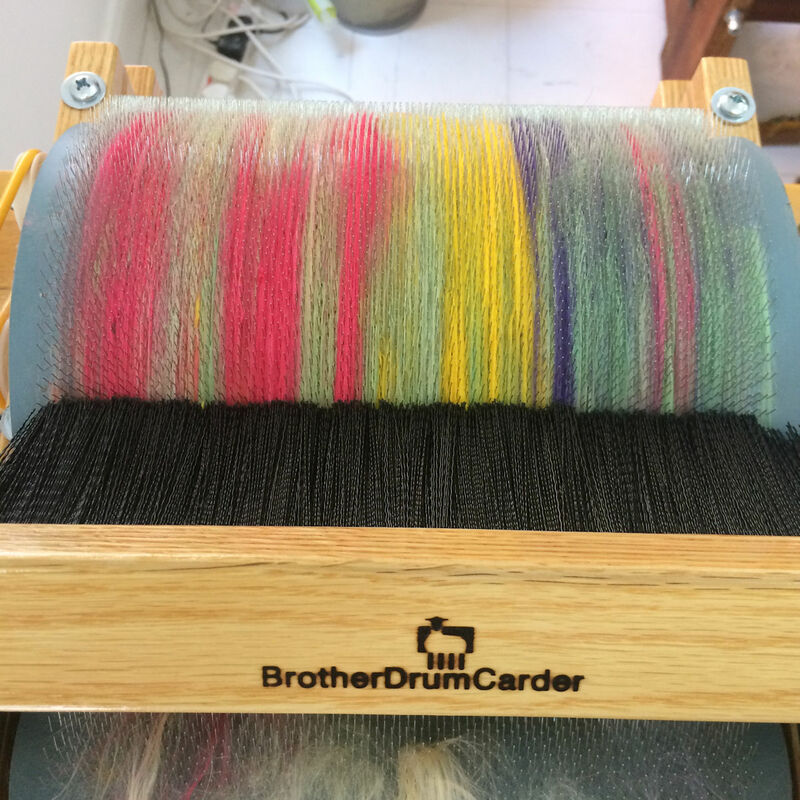 My new Brother Electric Drum Carder arrived a few days ago. I am so thrilled with it. 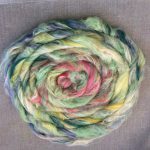 Now I am able to blend colours and different fibres to make wonderful roving and art batts, using the wide variety of plant fibres that I have on hand. 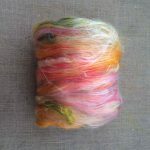 I discovered as I was spinning some of these Spin Flora vegan fibres, that they are a bit easier to spin when there is a blend of different fibres. On their own, they can be quite slippery to spin, but mixing them into a blend, spinning is more manageable. I suppose the different fibres create a bit of friction between them, helping the fibres stay together better. 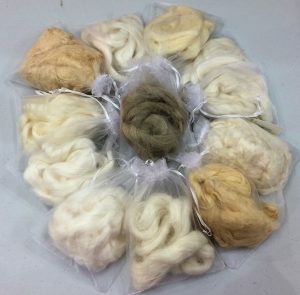 The first blend that I made was a combination of Dyed Bamboo Top, Soyabean roving and Pearl Infused Cellulose. After carding, I made these into small punis. 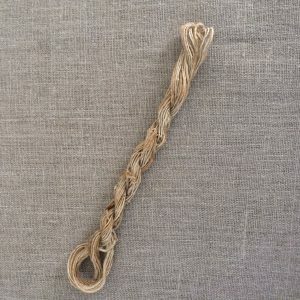 If you are having trouble spinning vegan based fibres with a worsted draw, try rolling the fibre into a puni and spinning it from the end. This will create more of a woollen type of yarn, as the fibres are criss crossing each other. This also creates a softer and loftier yarn as there is more air space between the fibres. I am spinning some of this fibre into a singles now, and will be Navajo plying it, to also give the yarn more texture. For my second special fibre blend, I took inspiration from the flowers that are in bloom in my garden. 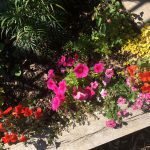 A small patch of Orange Nasturtiums and Hot Pink Petunias combine to create a summery yarn. 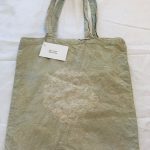 This carded batt uses both commercially dyed Bamboo, hand dyed Soya silk (that I dyed with Earth friendly acid dyes) and some Tencel. 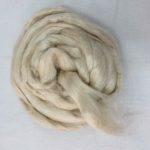 Many of the new plant fibres that are available on the market today (and in my Spin Flora shop) owe their beginnings to the invention of Tencel or Lyocell fibre. 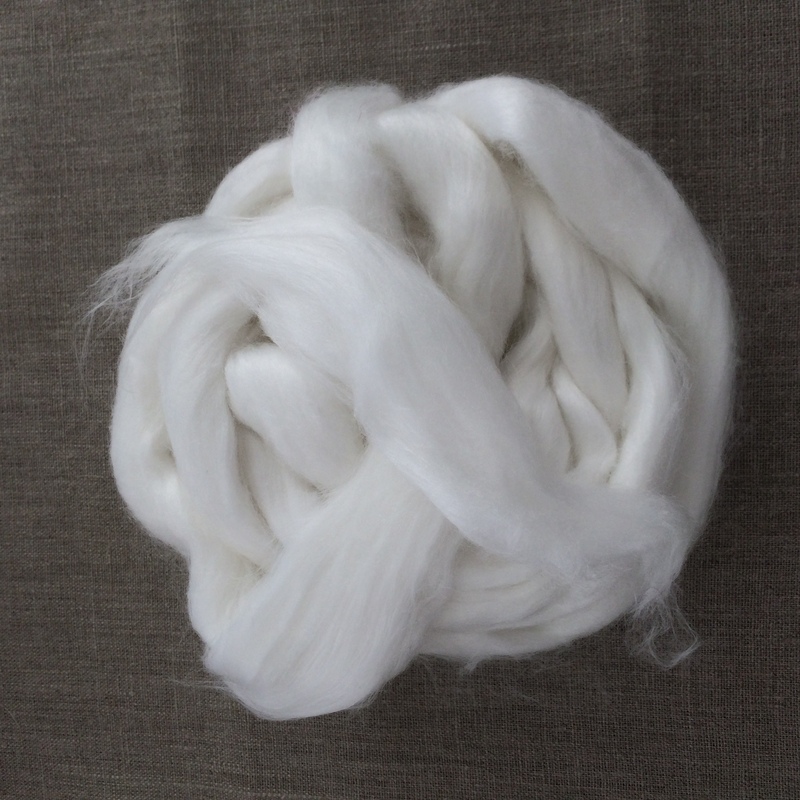 Tencel is one of the early rayon viscose type of fibres that was invented in the 1970’s. 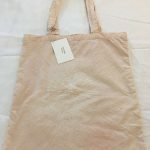 Tencel is made out of cellulose or wood pulp. Hardwood logs are chipped into small pieces and dissolved into a pulp by soaking it in amino oxides and chemicals. The cellulose solution is pumped through a spinneret much like a showerhead to produce fine strands of fibre. 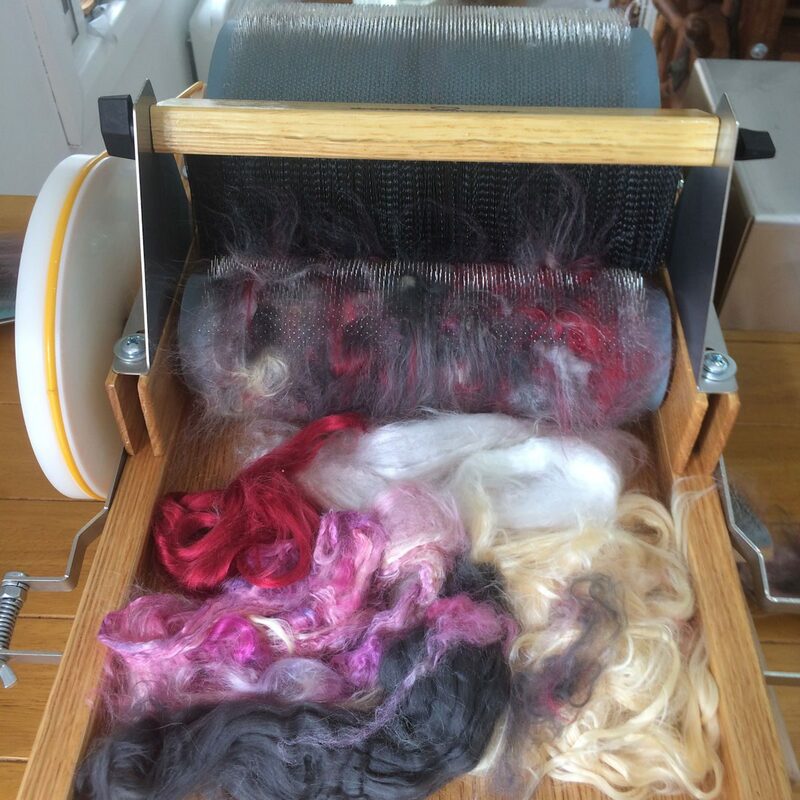 The strands are rinsed and dried and carded into spinning fibre. The chemical solutions that are used to process the fibre are recycled back into the system. 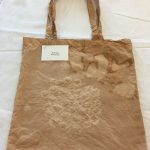 There is generally little waste product so that this process is considered to be relatively eco-friendly. This same process is used to turn other plant fibres into a pulp solution and spun into yarn. 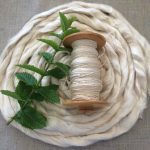 A few of the new and interesting Spin Flora fibres that you can find in my Web Shop are Mint and Pearls. Mint Infused cellulose spinning fibre. Biodegradable cellulose fibre has been infused with natural mint leaves that give the fiber natural antibacterial and cooling properties. The colour of this roving is a light shade of latte. 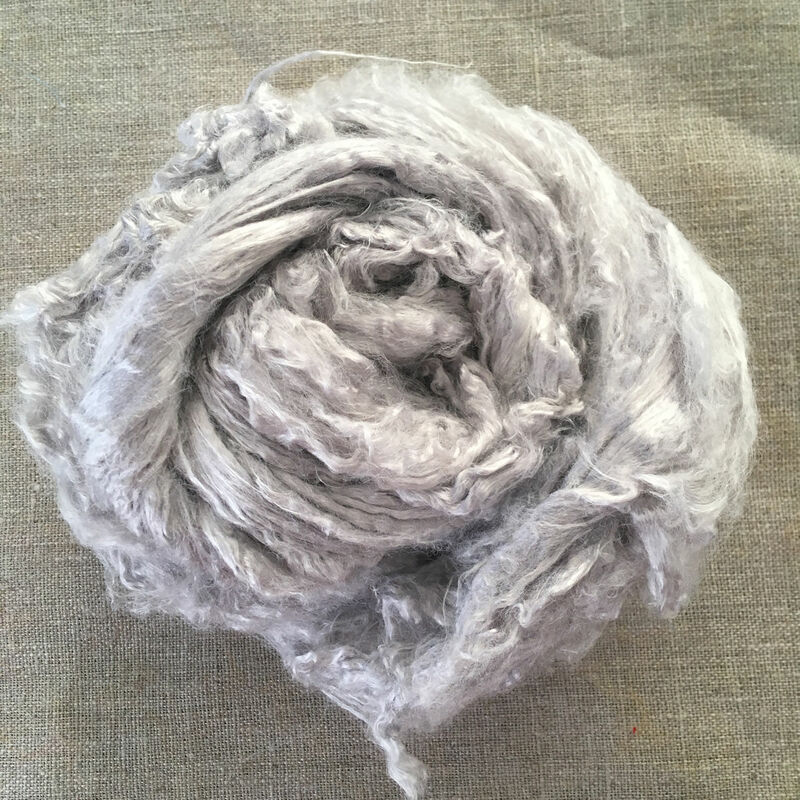 Sorry, the roving does not smell like mint leaves but has a very soft and cottony texture. 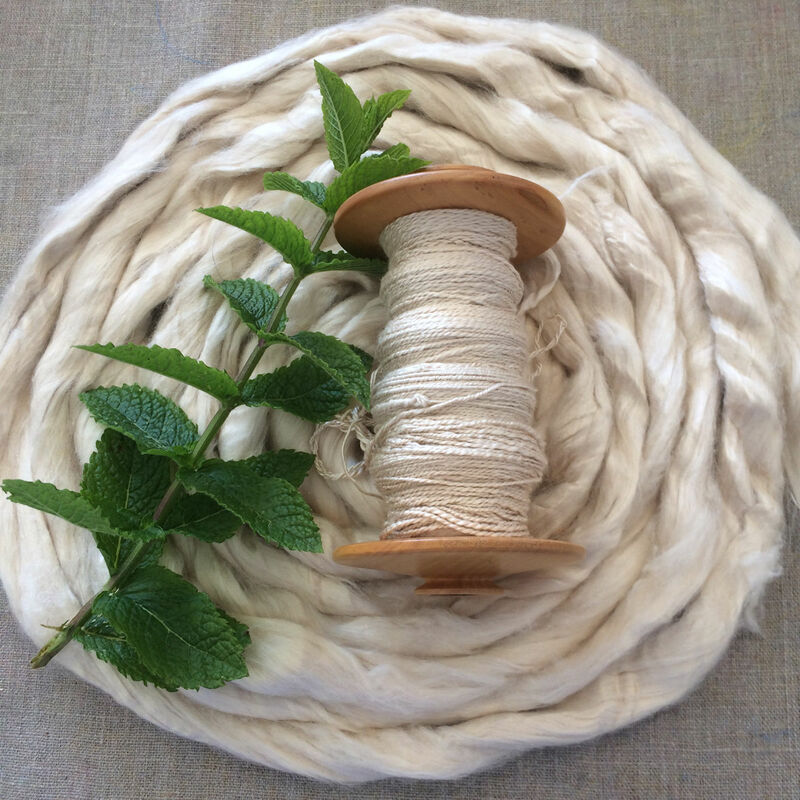 The Mint top can be spun on its own or blended with other fibres. Pearl infused cellulose spinning fibre. Biodegradable cellulose fibre has been infused with nano pearl dust that contains natural amino acids and trace elements. The pearl fibre is a natural UVA protector, Pearl fibre has a fantastic drapability. 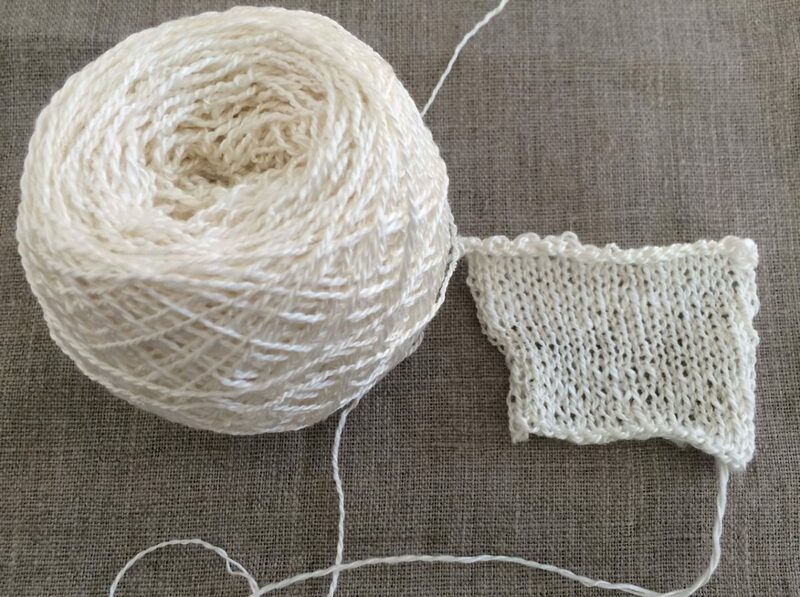 Please note: Since Pearls are made by oysters, this yarn is not vegan. 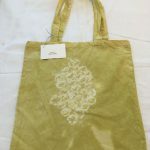 If you would like to try some of these new flora fibres, you can order them through my Web Shop. If you would like to keep in touch, please visit and Like Spin Flora on Facebook. 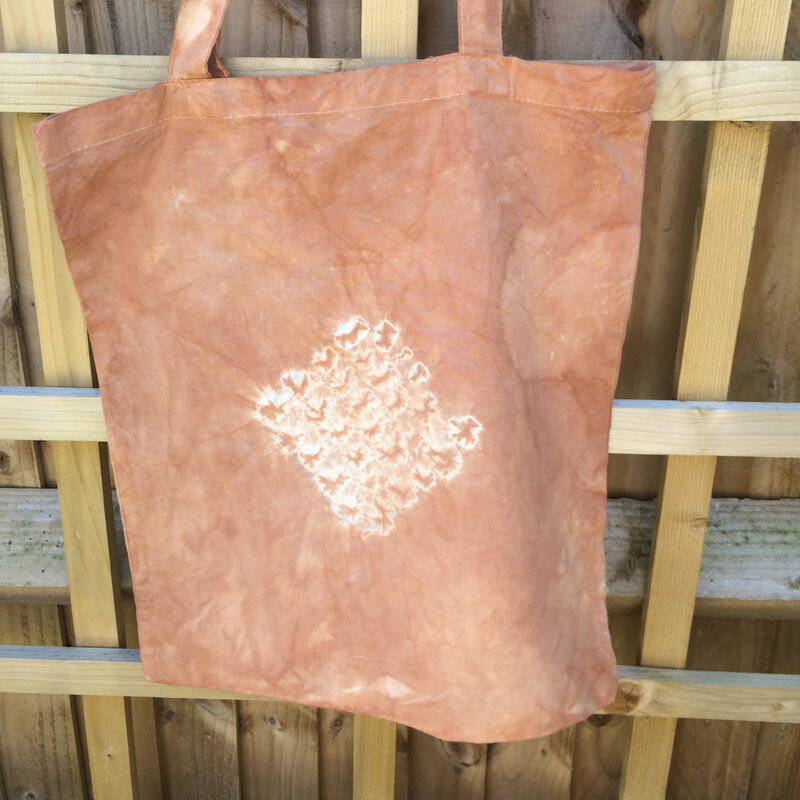 I always have a plastic bucket in my kitchen to gather onion skins for dyeing yarn, but more recently I discovered that avocado skins will also give colour. I have seen mixed results with avocado, mostly ranging from the palest pink to light shades of grey. So I wasn’t totally convinced that this would work. But I set up another plastic bucket to save the avocado skins rather than putting them down the waste disposal. I also kept the pits as they have valuable tannin, which is needed for mordanting plant fibres. 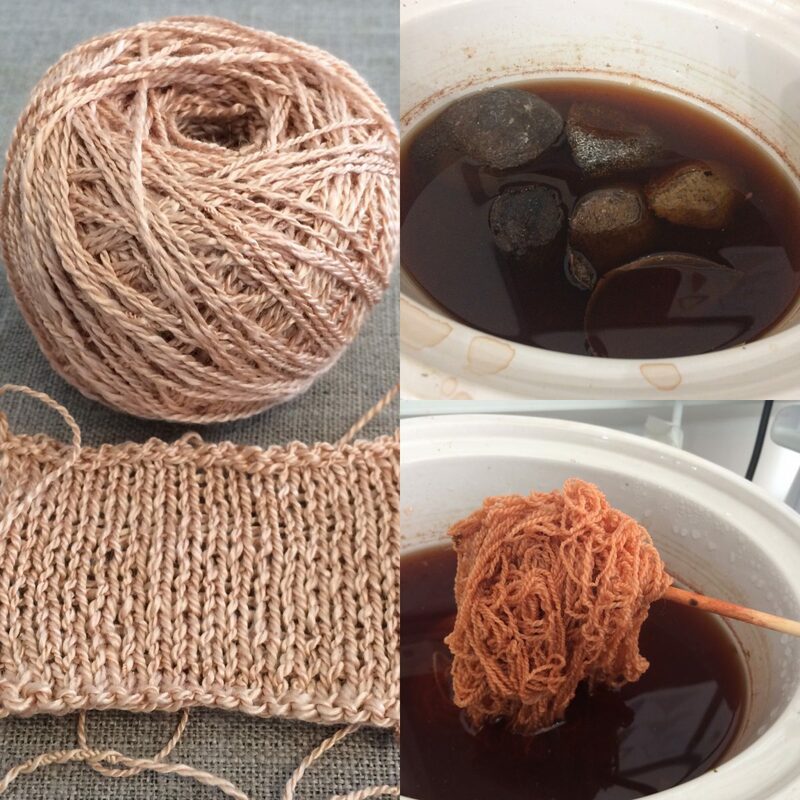 I removed all the avocado skins and I added the Seacell yarn that I had handspun into the avocado dye stock solution. I put the lid onto the stock pot and let the yarn simmer for a few hours. To my delight and surprise the seacell yarn had taken the colour quite nicely. I let the dyebath cool and removed the yarn. I rinsed it out and let it dry. The yarn did lighten a bit once it dried, but I am quite pleased with the colour. And using my red onion skin bath I also dyed some handspun flax yarn. Please visit my Web Shop if you are looking for plant dyed handspun yarns. If you would like to keep in touch with the latest updates on Spin Flora, please visit and like Spin Flora on Facebook or sign up for my Newsletter. 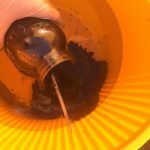 An Indigo Vat can be challenging to maintain but also rewarding. It must be nurtured, stirred and fed regularly to keep it happy. 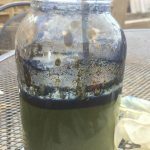 When you take care of the Vat, you will be rewarded with the most wonderful Blues, as the magic of the Vat transforms anything that enters it from green to blue. 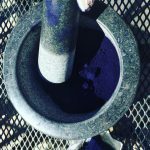 I made a Ferrous Indigo Vat using The Maiwa Handprints Indigo dye recipe. This type of vat is suitable for cellulose fibres, such as linen, cotton and other plant fibres. It is not advisable to use it on wool, as this contains Iron (Ferrous sulphate) which can be corrosive to wool and other protein fibres. 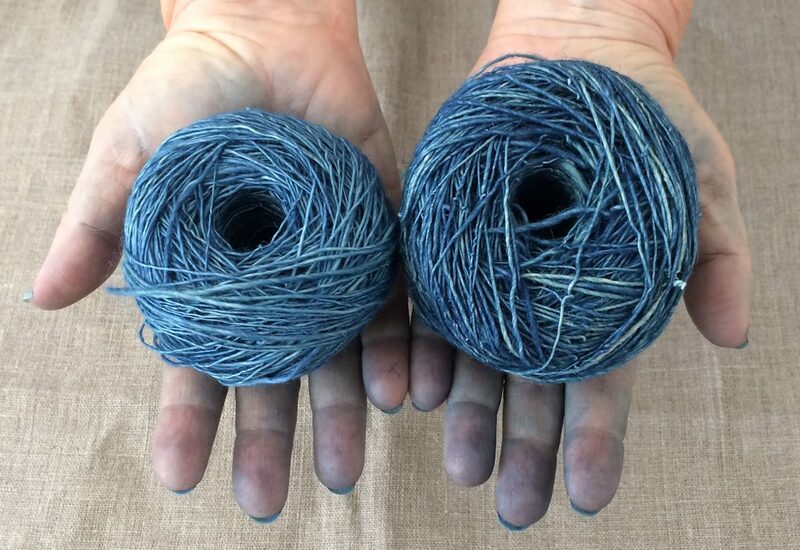 Please check my Web Shop for Hemp, Ramie and other handspun yarns and textiles that have been dyed in my Indigo Vat. If you would like to keep in touch to find out more about Spin Flora, please like and visit Spin Flora on Facebook , or sign up for my Newsletter. Handspinning some of these new cellulose yarns takes a bit of practice and the use of different spinning techniques. The cellulose fibres are very smooth and slippery, much like spinning silk. Cellulose fibres do not have the crimp that wool has to enable it to hold together. The fibres do not felt very well on their own. For felting, it is best to blend them with wool. When you spin wool as a single ply, you can felt or full it slightly to help the yarn hold together. With Seacell, Tencel, Rose and other such fibres you can’t. 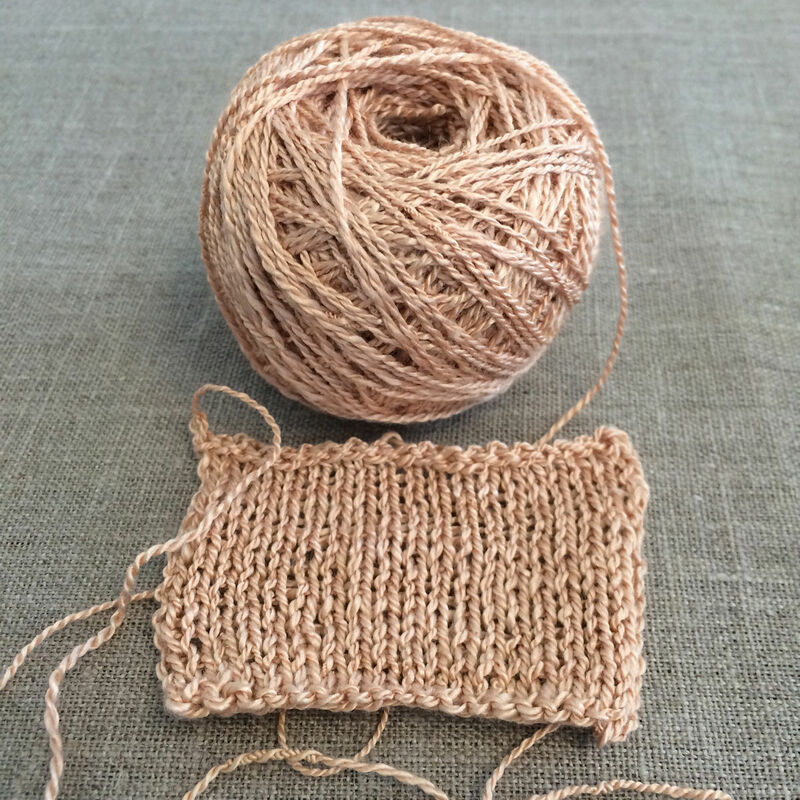 The finished single ply yarn will tend to slip and stretch. As an example, my daughter knitted her own wedding dress last year – she is a very talented and beautiful knitter. The dress was full length and lacey. 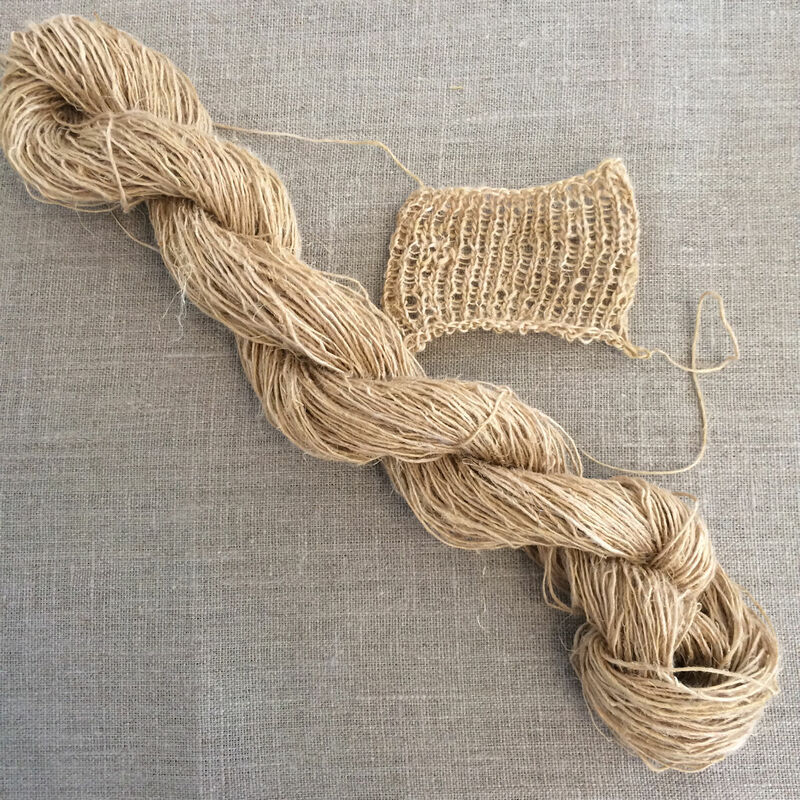 She chose to knit with a commercially spun bamboo yarn, very lovely – but spun as a singles. The samples that she knitted looked great, so she continued on and knit the dress. About 2 weeks before the wedding, she tried it on, and it stretched – A LOT! The weight of the full length dress immediately caused it to lengthen about 6 inches. Guess who got a frantic phone call asking for help to take it all apart and shorten it? 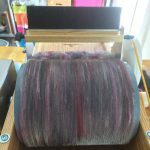 In my opinion, for spinning these types of fibres, it is better to spin and ply the yarn to give it some hold and balance. 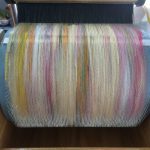 Yes, plying takes a bit longer to do, but in the long run, it can create a better yarn that is more fit for purpose. To spin a fine weight singles, reduce the tension on your bobbin to allow you more time to draft a smaller amount of yarn. When you reduce the speed of the takeup less friction is placed on the fibre so you are able to draft less fibre during spinning, creating a finer yarn. 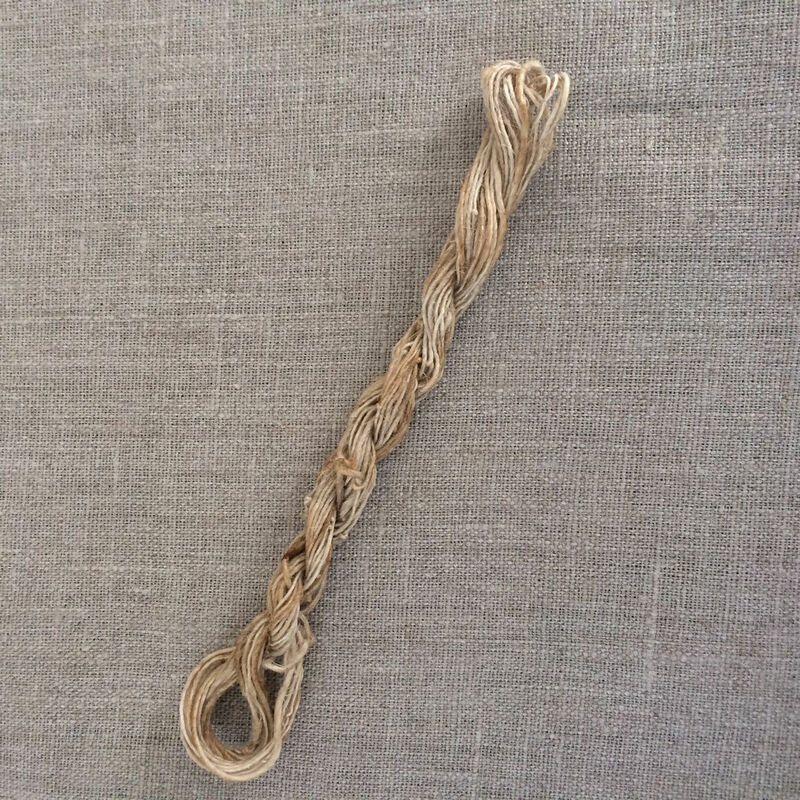 Spin the yarn with a high twist, so use the smallest whorl on your bobbin. On my Kromski wheel, this is a ratio of 14:1. Then ply the 2 bobbins of singles yarn in the opposite direction to what you spun the singles, using the middle whorl of the bobbin. 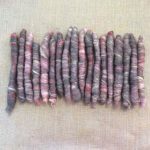 If you would like to try spinning some Seacell, you may purchase some from my Webshop. For more information about spinning some of these cellulose fibres, please visit my Allfiberarts website. 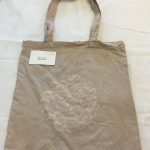 If you would like to keep in touch and find out more about spinning and dyeing with plants, please Like and Follow the new SpinFlora Facebook page or sign up for my Newsletter. 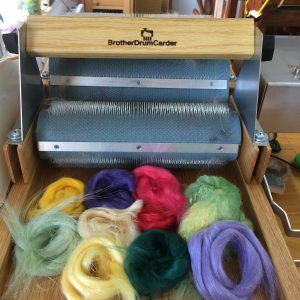 I have been a handweaver, hand spinner and dyer for many years, mostly working with traditional fibres such as wools and silk. Recently I discovered the newly expanding world of plant fibres. 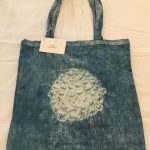 With developments in textile technology, wonderful new fibres for the hand spinner and felt maker have become available.Derived from materials previously thought of as waste, these fibres are reclaimed from plants such as bamboo, bananas, rose stems and other cellulose materials. I purchased a few small samples and began to spin them. I fell in love with the silky softness, textures and diversity that plants can offer to the textile world. 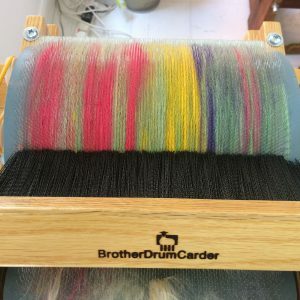 Looking at some of the new handspun yarns I had created, I thought that adding a bit of colour would make them even more beautiful. 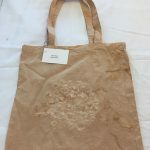 It didn’t seem appropriate to use chemical dyes to colour them – plants must be dyed with plants. So my small experiments with the world of plants carried on. 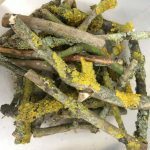 The natural dye pots and vats came out of my cupboard and were again filled with tree barks, roots and flowers. 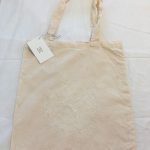 I soon found out, that the traditional natural dye recipes needed a few tweaks and modifications to work with cellulose rather than protein fibres. 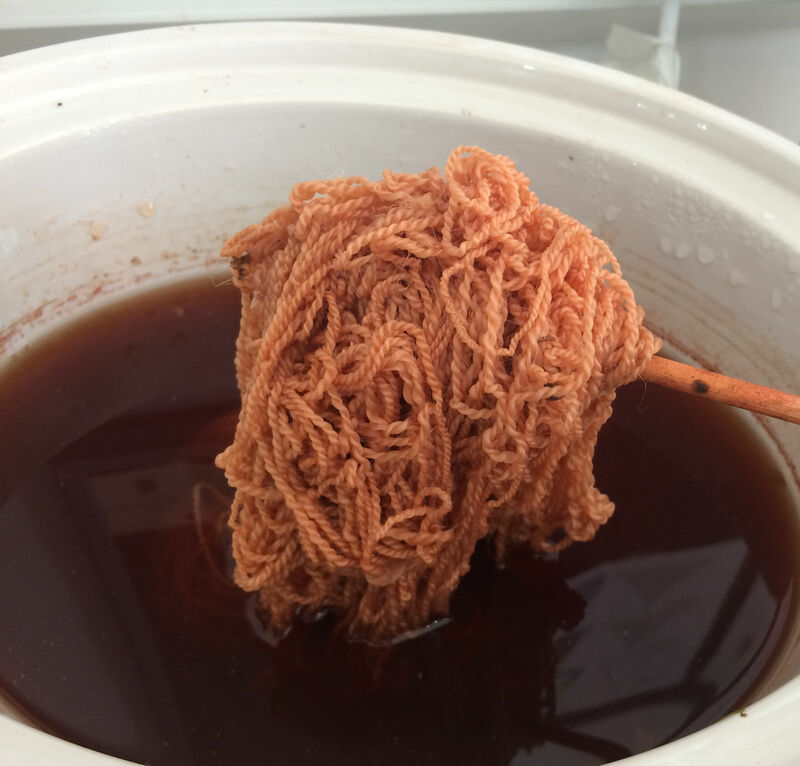 The mordants that prepare the fibre to absorb the dye had to be changed. The temperature and length of time in the dyebath were revised. Even the colours that you expect to achieve are different when you dye a plant rather than a wool. Expect the unexpected. 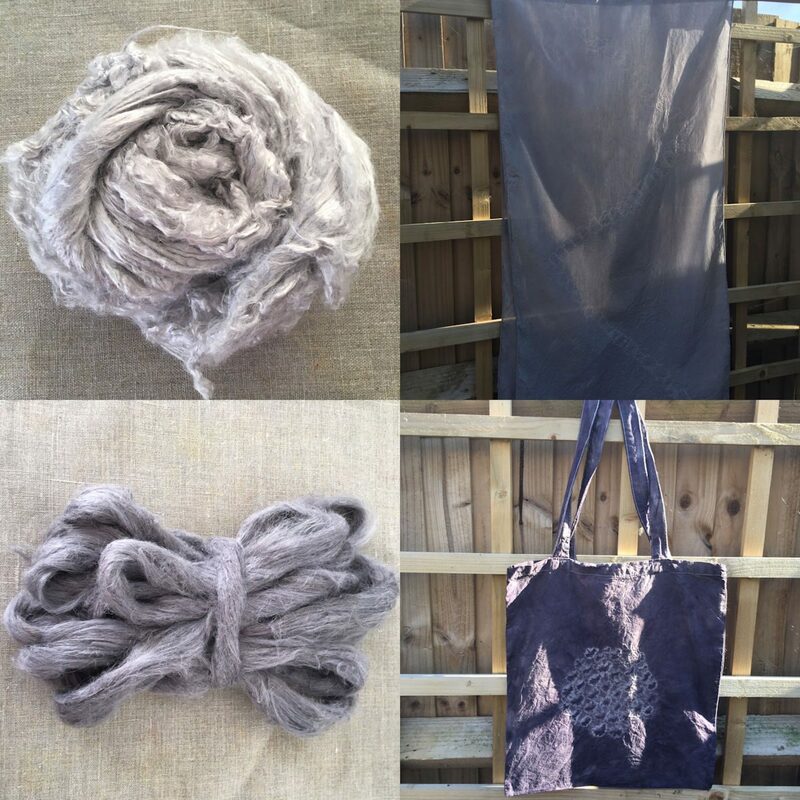 The natural dye bath is a new discovery every day. Here are some of my yarns and discoveries. 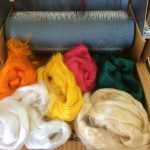 If you would like to keep in touch and find out more about the latest hand spun yarns, fibres and other vegan friendly products, please Like and Follow the new Spin Flora Facebook Page or sign up for my Email Newsletter.